After a magical run to the Stanley Cup finals last year, Nashville has the unenviable task of proving it was no fluke - and they'll have a huge target on their backs as they try to do so. They claimed the final wild-card spot in the Western Conference and had fewer points than all eight Eastern Conference playoff teams as well. Yet all you need is a ticket to the dance, and they made the most of theirs. They stunned top seed Chicago in four games then out-gutted St. Louis and Anaheim in six games each before falling to Pittsburgh in six. Their run was exciting, their building was electric, and they gained a lot of fans. Everything went their way, and their stellar defensive unit earned their money. But doing it again won't be easy. Heck, even getting a chance to do it again will be tough - the West is so deep this year that some good teams will miss the playoffs. Does Nashville have what it takes to duplicate their success? Or, like other lower seeds that have made deep runs in the past, will they just come crashing back to earth this year? Winning is expensive, so the first order of business facing the team was on the contract front. They locked up two core pieces long term. 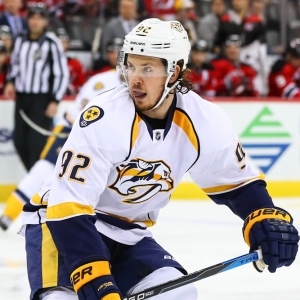 Top-line center Ryan Johansen led the team in points, and Viktor Arvidsson led in goals. Johansen is the older of the two at 25, and now both are locked up long term. Johansen got $64 million over eight years, and Arvidsson was almost a bargain at $29.75 million over seven years. They also locked up playoff surprise Frederick Gaudreau for three years and almost no money, and they did a few more deals. Winning also brings change, and there was plenty here. Captain Mike Fisher retired at age 37, leaving a void in leadership that exceeds his impact on the ice recently. Colin Wilson was traded to Colorado for a pick, and James Neal was allowed to go to Vegas in the expansion draft. Neither loss is crushing by itself - though I would have kept Neal if I was in charge - but the three departures force changes up front. Part of the solution came from the team that beat them in the Cup, and Pittsburgh center Nick Bonino joined the team in free agency on a four-year deal. He knows how to win and is a fairly useful player in the right role, so it's a move that is easy to like. Less likeable was the addition of Scott Hartnell. Apparently they felt like they needed to add a 35-year-old guy when another geezer retired, but it sure feels like the game has passed Hartnell by. More forward help should come from within as the team hopes that 2014 second-round pick Vladislav Kamenev is ready to step up from the AHL as a center. The team has their core locked up, they have a truly spectacular defensive unit - supplemented by the addition of Alexei Emelin through another trade. The coaching is strong. There is a lot to like. There are concerns, though. Pekka Rinne turns 35 in November, so the star goalie can't be relied upon forever. And stellar defenseman Ryan Ellis has been injured and will miss the first four to six months of the season. That's a blow. What the team did in the playoffs last year is no fluke. The problem, though, is that Dallas, which missed the playoffs last year, is dramatically improved, Calgary is better, Winnipeg is dangerous, the Kings are better, and so on. Just making the playoffs is going to be tough in the West this year, and Nashville hasn't done enough to move themselves into the realm of the playoff locks - especially without Ellis. Nashville's second game of the season is a Stanley Cup rematch at Pittsburgh. Game 4 is against Dallas, and Game 5 is at Chicago. They have three great chances to prove early that last year was no fluke and to really make an early statement - or to fall into an early hole and have their confidence challenged. Bovada has Nashville at +1400 to win the Stanley Cup, which has them tied with five other teams as the fifth choice to win the Cup. That feels optimistic in my eyes. BetOnline has them tied with two other teams as the third choice to win the Western Conference at +700, behind favored Edmonton and Chicago. They are co-favorites to win the Central Division with Chicago at +350. Minnesota and Dallas are right on their heels at +375, though. The season win total is set at 44. They won 41 games last year. I'm not nearly as optimistic as the oddsmakers are. I certainly am not betting they won't make the playoffs, but nor would I be particularly shocked if they didn't. They will be in the mix to the end, but so will a lot of other teams. They haven't done enough to earn more respect from me than that. Doc's Sports is offering new clients a great deal for $60 in free hockey picks from any of their expert NHL handicapping experts. This offer has no hidden fees or obligations, and you will never have to deal with a salesperson or enter any credit card info. Get your free hockey betting picks here - quick and easy. Also, for a limited time get three hockey handicappers for the price of one! Click here for our 3-for-1 NHL picks offer .